Parrot Height Dominance – Fact Or Fiction? 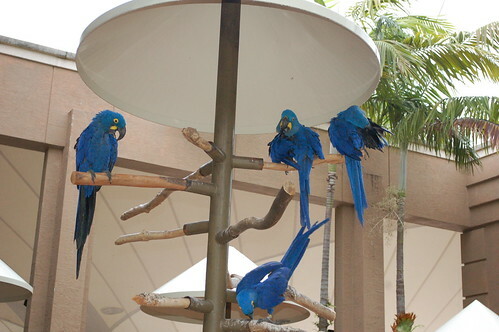 Almost all parrot owners have heard that they should not allow their parrots to be higher than them, or above their eye level, because it brings out in them an innate need to express their dominance over us, and that we should never keep a large parrot on our shoulders for this same reason. I agree that we shouldn’t keep our bigger birds on our shoulders, but not because of height dominance issues. Logic tells me it is unsafe to have easily startled animal with a hard, pointy contraption on its face anywhere near my eyes. Ever. While it might be true that a parrot feels more confidence at a higher level, and that they definitely have the advantage over humans while there, I think a better word to describe it would be height defiance. It is my belief that when a strong-willed parrot behaves badly at a higher altitude, he likely behaves badly at a lower one too. When Linus climbs to the top of his domed cage and locks his toes around the bars, it can be a struggle to get him down. This is where he chooses to go when he feels the need for a good scream-fest, announcing to the world: “I am cockatoo – hear me roar”, and this is the place where he has the best opportunity to really go to town on his cage cover. He goes to the top of his cage not because he wants to show me who’s boss, but because he has important things to do there. Once he is done, my hearing reduced, his cage cover in tatters, he comes down. I keep a chair near the side of the cage for times when I need him to come down sooner, but he manages to get to the other side of the dome before I do every time. He plays ‘keep away’ when he is on the floor as well. It truly is a game to him and nothing more. 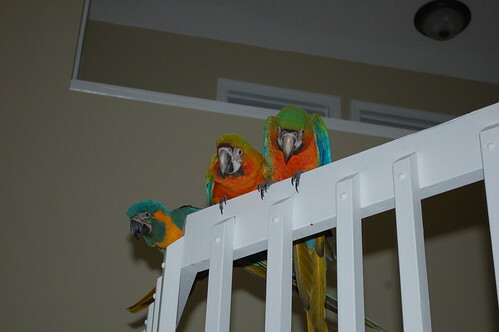 Height is a natural thing to parrots, they gravitate towards high points. How they behave once there is a direct result of their training and behavior management. Or the lack of it.